A few days ago every space enthusiast got sentimental when, after 45 years of operation, the iconic countdown clock at NASA's Kennedy Space Center's Press Site was disassembled for removal. 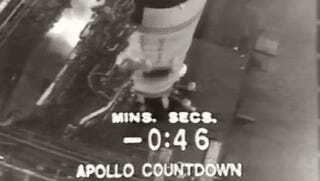 Perhaps more than any other piece of equipment near the launch site, the countdown clock was a piece of history. The clock was designed by local NASA engineers and built by local NASA technicians in 1969, and first used at the Apollo 12 launch. But now the digital countdown timer, which ticked off NASA's manned and unmanned missions as they lifted off from nearby Cape Canaveral Air Force Station, is gone. The three blue boxes are 6 feet high, 3 feet deep, and 26 feet wide altogether (not including the triangular concrete and aluminum base). The six digits are four feet high and two feet wide, and uses 56 totally ordinary 40-watt light bulbs. There are 349 total light bulbs displaying how many hours, minutes and seconds have to elapse until lift off. The clock is controlled from the nearby Launch Control Center (LCC), activated by the Timing and Imaging Technical Support Group, the "timing crew" before a launch. The clock counts down to T-zero, to the moment when the launch vehicle lift off the pad, and after launch, the clock keeps ticking, showing the so called "mission-elapsed time" (MET). Over the years, we've had to keep circuits up with all the lightning in the area. We've also had to keep it dry inside with dehumidifiers. NASA officials hope the new, much brighter display will be accepted like its predecessor, which likely will be on display at the Visitor Complex nearby. Until then, here is our sentimental collection commemorating some of the greatest moments in the life of the original clock. Launch of the Apollo 12 Moon mission, Nov 14, 1969. A few hours before the Apollo 17 launch, Dec. 6, 1972. Terrific photos of the Skylab-1 launch, May 14, 1973. Six seconds into the first flight of the space shuttle Challenger, April 4, 1983. Scrubbed: The countdown clock stops with only nine minutes left as space shuttle Endeavour sits on launch pad 39-B May 30, 2002. The sun rises over the launch clock that is counting down for the Space Shuttle Discovery at the Kennedy Space Center July 13, 2005. The mission was launched 13 days later, and it was the first since the Columbia disaster. Space Shuttle Discovery sits on launch pad 39 on July 4, 2006, waiting for a third attempt to be launched after weather conditions stopped two previous attempts. Discovery sits on Pad 39B, Dec. 7, 2006. The countdown clock was held at 5:00 minutes and NASA officials scrubbed the launch because of weather concerns. Feb 15, 2007: Atop the massive mobile launcher platform and crawler-transporter, Space Shuttle Atlantis rolls slowly toward Launch Pad 39A. Oct 28, 2009: Liftoff from Launch Complex 39B of a new vehicle, the Constellation Program's Ares I-X test rocket. This was the first launch from Kennedy's pads of a vehicle other than the Space Shuttle since the Apollo Program's Saturn rockets were retired. March 1, 2010: After an ocean voyage from NASA’s Michoud Assembly Facility near New Orleans, a tugboat delivers the Pegasus barge carrying External Tank-136 to the turn basin at Kennedy Space Center. April 5, 2010: Space Shuttle Discovery lifts off of pad 39a, on a mission to the International Space Station. Feb 8, 2010: Endeavour and its six-member STS-130 crew head toward Earth orbit and rendezvous with the International Space Station. Before Endeavour's final flight, May 16, 2011. July 6, 2011: 22 hours, 10 minutes, 7 seconds to the last space shuttle launch. Atlantis awaits in the background for the final space shuttle launch (July 6, 2011). Iconic clock with iconic building. The countdown clock always has been tied visually with the flagpole 34 feet away. Officially called "The Press Site: Clock and Flag Pole," the pair were listed in the National Register of Historic Places on Jan 21, 2000. July 8, 2011: T-31 seconds and holding! The space shuttle Atlantis lifts off from the Kennedy Space Center Friday, July 8, 2011. Sept 21, 2014, the last launch witnessed: SpaceX Falcon 9 rocket lifts off from Launch Complex 40 carrying the Dragon resupply spacecraft to the International Space Station. Nov 3, 2014: Public Affairs Officer George Diller shovels the first scoop of soil behind the retiring countdown clock during the groundbreaking ceremony for the new countdown clock. Nov 24, 2014: the historic countdown clock at the spaceport's Press Site is disassembled and removed. Top animgif: Attila Nagy/Gizmodo. Technical background: Frank Ochoa-Gonzales/NASA's Kennedy Space Center.